The Fujifilm FinePix AX245 is the ideal camera for those who want good basics in a compact camera. This 12MP camera gives you crisp images that won't distort when you crop or enlarge. With 4X optical zoom lens, you'll be closer to the action than ever before. Convenient shooting scenes automatically adjust the camera for your environment, and smart features like digital image stabilization, face detection and red-eye reduction help to get a great photo every time. Best of all, with the sleek and slim profile, the FinePix AX245 can slip comfortably into your pocket or purse, so you'll always be ready to grab that perfect shot! 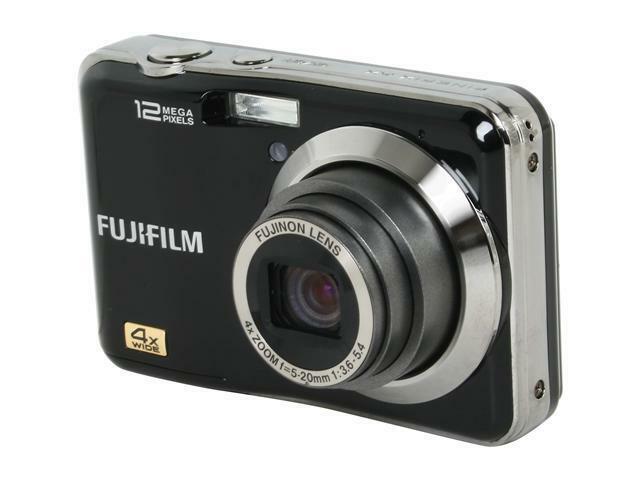 12.0 Megapixel Image Sensor The Fujifilm FinePix AX245 features an amazing 12.0 megapixel effective image sensor to provide profound image detail with unparalleled richness and depth, and the ultimate flexibility in enlarging and cropping shots. 4X Optical Zoom Lens The FUJIFILM FinePix AX245 features 4X optical zoom lens to bring far-away objects up close for exceptionally sharp, clear images. Face Detection Technology The Face Detection technology significantly improves your picture taking quality by automatically identifying facial features in the frame, and determining the optimum focus and exposure settings in real time for professional-quality photos. Scene Recognition Auto Mode The Scene Recognition Auto (SR Auto) mode automatically detects the environments of scenes and adjusts the camera accordingly to perfect setting, making stunning photography as easy as point-and-shoot. HD Movie Recording The Fujifilm FinePix AX245 captures videos in high-definition 720p format for unprecedented high definition image clarity. 2.7" Screen The spacious 2.7-inch LCD with a 230,000-dots displays a superb clarity of photo details, slideshows, micro thumbnail view, and a user-friendly graphical interface menu. (Auto mode) 1/4 sec. to 1/1400 sec. (All other modes) 8 sec. to 1/1400 sec. Wide: Approx. 10cm - 70cm / 3.9 in. - 2.3 ft.
Telephoto: Approx. 35cm - 70cm / 1.2 ft. - 2.3 ft. Wide: Approx. 60cm - 3.5m / 2.0 ft. - 11.5 ft.
Telephoto: Approx. 60cm - 2.0m / 2.0 ft. - 6.6 ft.
Approx. 30cm - 80cm / 1.0ft. - 2.6 ft.
3.7" x 2.4" x 1.1"
Cons: when you zoom in, all you get is a black image. the flash never works, even if you enable it, 12megapixels is a serious bluff. i uploaded pics from this and my grandma's 6megapixel camera and her's still looked better(they were of the same exact thing), when the flash does work it doesn't work at all, the zoom was hardly even worth it. Pros: Looked nice.. pretty package.. came with all it was advertised to. Fast shipping .. got to Vegas from CA in a day. Cons: Upon gifting this to a friend.. he opened the package and to our distraught upon placing the batteries in and turning on the camera there was no focus!! We attempted to reset the mode to that which the directions called for and restart the camera.. after that point it quit functioning all together. It appears that I got the one bad apple.. awaiting my RMA to return. After talking to a friend who specializes in cameras it was his assumption the mirror is detached or was broken in transit. :/ Bah.. Will update when I receive the working product.